If you’ve followed my articles for any length of time, you’ll know I’ve been one of the front runners pushing that zombies are the new “It” marketing tool in the gaming world. Without a doubt the steady stream of success stories over the past few years have fueled a new wave of impressive kickstarter projects to rise faster than the living dead. Of them one particular project has kept my eye and I couldn’t be happier to see it funded. 7 Days to Die managed to get over double of the goal pledged by its multitude of ravenous fan backers. The game recently went into alpha and I was among the select group that had patiently been waiting for the day we would receive an invite email. 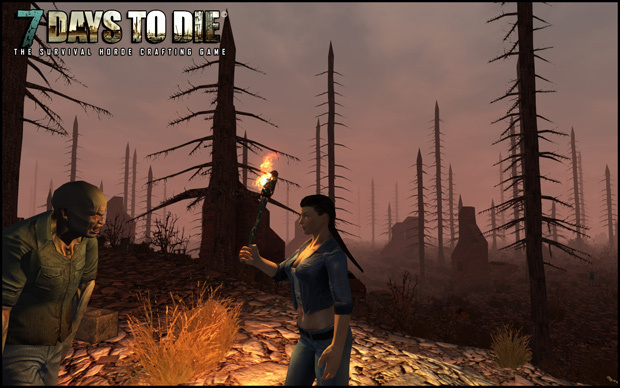 7 Days to Die is an open world, voxel-based, sandbox game that is as they would like to say, a unique mash up of a First Person Shooter, Survival Horror, Tower Defense and role playing. 7 Days to Die shoots for the stars with full polished systems for combat, crafting, looting, mining, exploration and character growth. Or as I would like to say it, a better looking Minecraft that is more focused on zombies and interacting with the world. Only it’s set in a post-apocalyptic Earth torn apart by World War III. But the worst was yet to come. No one knows for sure where it began or what has caused it; it might have been the radiation or biochemical weapons, but one thing was for sure, humanity has changed. And it wasn’t for the better. You play as one of the survivors that didn’t turn into a zombie. You’re one of the lucky few that unfortunately are stuck in Navezgane Country, Arizona. When you first spawn you will notice the destruction and decay of modern society all around you. Granted it might not be as stark of a contrast in a small desert town in Arizona as it would be in the major cities. But that isolation is likely why it was such an ideal place to survive the initial outbreak. Your job is to survive, and the concept is quite simple. 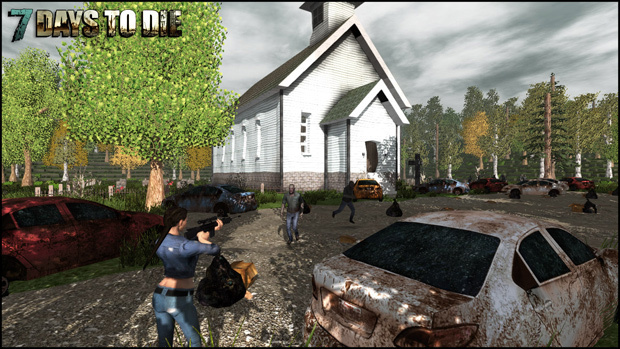 Find shelter, loot everything you find, and try to keep some ground between you and the zombies in the meantime. Now that sounds easier than it actually is, though the common mistake most players make is taking it easy during their first day in-game. When it’s light outside, the zombies are a minor threat as they slowly hobble around and show minor interest in your presence. If you manage to keep your itchy trigger finger at ease, you can typically go an entire day cycle without firing a shot. But once it gets dark, you better have some sort of shelter prepared or your chances of surviving the night are on par as an isolated motorist in Will Smith’s I am Legend. At night the zombies will run faster, fight harder, and even attempt to outsmart you! Even when you have shelter, paranoia will start to set in with every bump and creak in the night. 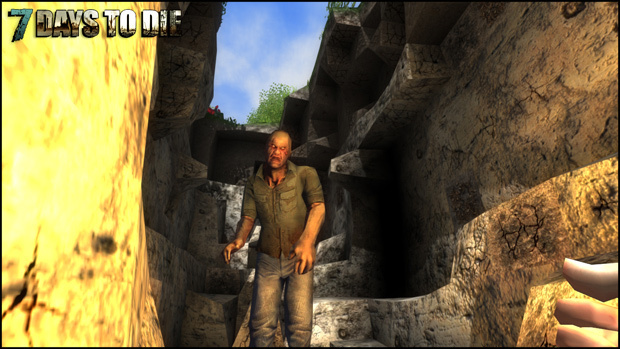 Everything in 7 Days to Die is destructible environment, and the zombies know this. They will be knocking on your front door and won’t hesitate to break it down if you refuse to answer. Luckily the Minecraft elements allow you to set-up traps to ambush the zombies and keep them pacified until the sun rises again. But now that you have an overview, let’s talk details. When you first spawn, you’ll have to gather resources fast. The typical suspects such as wood, tools, food and water can be used in crafting. I highly recommend starting with the wood since outside of town is the last place you’ll want to be at night, so hurry up and start punching some trees. Yeah it is a bad cliché, punching trees to get wood that is. 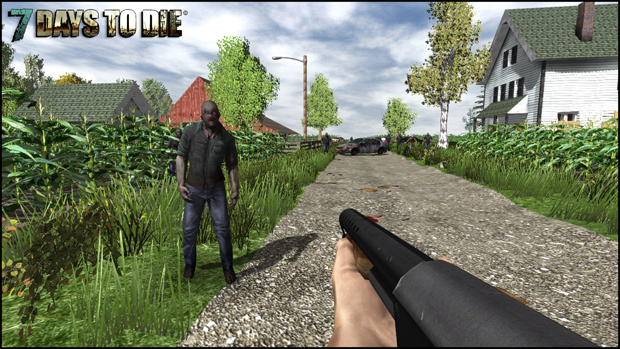 We’ve seen it before and I’m sure 7 Days to Die won’t be the last time we see it. But until you can build some tools, your bare hands are all you will have to aid you. And keep your wits about you if you intend to go deeper into the woods to gather your materials as danger lurks within. See the zombies aren’t functioning on some kind of biological clock. It’s the actual sunlight that reduces their effectiveness. So if you find yourself in an unlit house or dense forest canopy, prepare to face the same nightmares you hide from each evening. Scattered around the world you will find car wrecks, and garbage lying around that usually has some sort of loot in them. Around the maps you can find towns, and cities full of loot, but typically the bigger and more profitable the town, the larger the local zombie population. So don’t plan to take up residence unless you’re working with a small militia to do so. I have found several towns, and the immersion subtly built into each is top notch. You will feel your spine shiver as you’re drawn into a world where everything you knew is gone and all that remains is sparse supplies and unfeeling killers at every turn. Like I said, crafting is a huge deal in 7 Days to Die. Each block does something different, and while building blocks don’t operate perfectly on a realistic physics system, there is enough of one in place to sort of make sense. Sand can be easily destroyed, and is pretty worthless as a defensive block. It falls to the ground if you place it in the air with nothing beneath it. 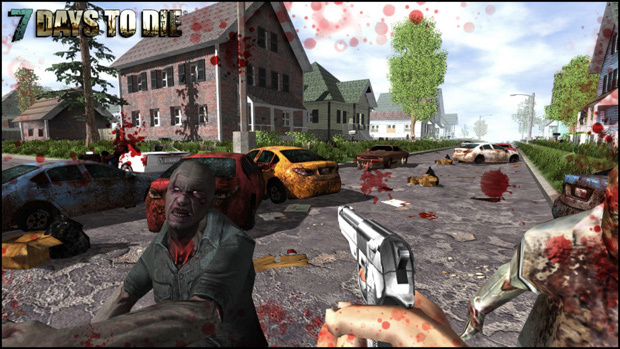 Gravity plays a part in most elements of the game, and can even be used as a weapon when defending from zombies. After chopping a tree, it will fall to the side and break into small logs. These logs can be changed into wood, and wood can be used to make more proper walls in your house, or even barricade a doorway. Blocks of materials can also be pushed into various crafting recipes to make weapons, furniture, and other items of various utility to support your survival. And a nifty in-game recipe book keeps track of each successful craft you discover, so you can automatically select it the next time you wish to make it. 7 Days to Die is a game inspired by many other games, but mainly Minecraft. I had high hopes for the game, and I must admit, I am not disappointed at all. The game is heavily focused on surviving, and makes you appreciate lasting long enough to build up a relaxing well defended home. The game itself is also beautiful looking; sure it isn’t Crysis level good looking, but it is definitely not an ugly game. Currently the game just went into Alpha, and it is far from being completed, but I can already say that I absolutely love it. I never thought I would enjoy a game with blocks again, but 7 Days to Die made it happen. With developers like this springing up left and right, I have high hopes for the sandbox survival genre in the coming years.